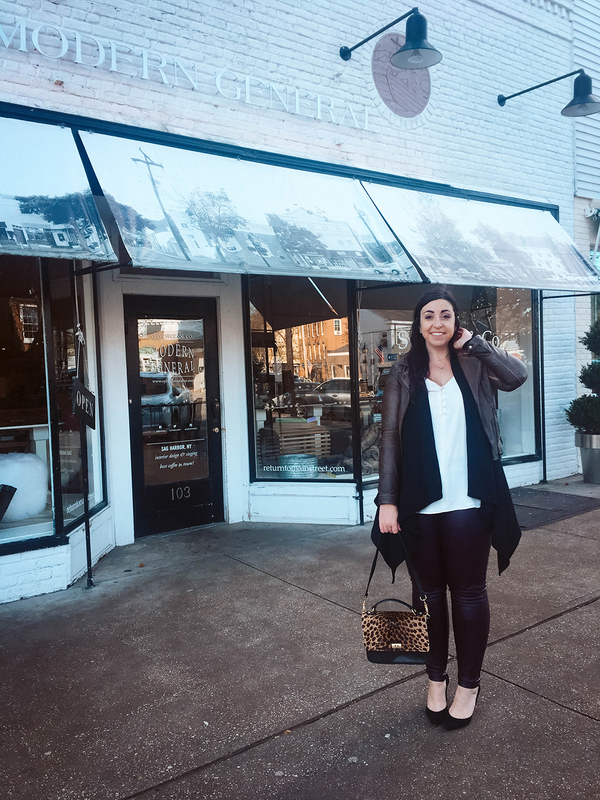 Earlier this week we took a look at two ways I style LOFT’s Faux Leather Leggings (on sale for $40 currently) for the city. Those outfits both feature the black pair. As we head into the weekend I’ve shifted locations from Brooklyn to Sag Harbor and colors from the black leggings to the fig berry. Alex’s Dad purchased a home in Sag Harbor back in the 1960s as a bachelor, long before Sag was considered part of the Hamptons or before the area was the Summer destination the way it is now. Today it’s a vibrant small town technically part of Southampton right next to super posh hamlets like Bridgehampton, East Hampton and so on. Alex’s parents have done a beautiful job of renovating their home while keeping its charm (I love the creaky original super wide plank flooring and the exposed ceiling beams, circa late 1700s! ), and we’re lucky enough to stay in the basement guest suite every time we come. That suite just so happens to include one of the house’s four fireplaces!! In the Winter, we get tons of use out of that. In the Summers it tends to become overwhelming to navigate the yachts, sports cars and celebs that pour into town, so Alex’s family rents out the house to family friends and we wait until the offseason to use it. I highly recommend visiting Sag Harbor if you ever have the chance! I’ll be publishing a weekend travel guide for it in February. Pardon me for sounding cliché, but it’s such a joy to have such a beautiful escape from the city. I feel very #blessed. There’s still a small town feel here such that I’ve gotten to know many people in town. The vibe in Sag tends to be upscale casual. You’ll see plenty men and women trotting around in athleisure to run errands. For any kind of going out, jeans are generally frowned upon in favor of anything a little more dressed up. Faux leather leggings totally fit the bill. This is the type of outfit my girlfriends and I call ‘posh.’ It’s styled effortlessly which I enjoy with a chic combination of elements and layering. I do love Fall dressing so much! The double pom pom hat is the lone trendy piece here — everything else is a true classic. The faux leather leggings are an easy way to give this outfit a touch of extra class. They take things up a notch from super casual to put-together casual. The nice thing about LOFT’s Faux Leather Leggings is that you can wear them in nearly any situation where you’d otherwise jeans. Yet they can also sub in for dress pants, which makes them a real 1-2 style punch! 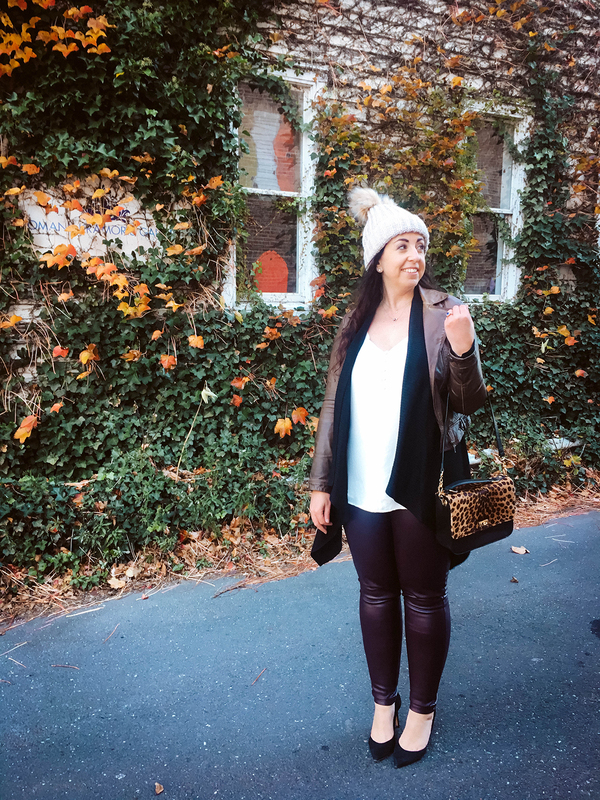 How do you style faux leather leggings? Please share in the comments. You can also find plenty of styling inspiration for them and other items on my Street Style Pinterest board. This weekend will be a big shopping weekend for me! With so many promotions happening I expect to do a bunch of gift shopping while picking up some items I’ve been waiting on for myself. Here are some of the best promos happening this weekend. AMERICAN EAGLE OUTFITTERS & AERIE| AE is offering $20 off $75+, $30 off $100+ and $50 off $150+ this weekend. At Aerie, enjoy 30% off apparel + free shipping. | Picks: Check out this recent post for all my AE and Aerie picks. ANTHROPOLOGIE | Lots of promos happening right now at Anthropologie! Firstly, take 20% off pants and jeans through Monday. Get my picks in this recent post. Then, make sure you’ve taken a look through the extra 40% off sale promo. I highly recommend this dress which you can see on me here. Next, take a look at select home items which are up to 30% off, and holiday decor which has select items at 25% off. Also, select furniture is up to 50% off and select kitchen and dining is 20% off. Whew. That’s a ton to keep track of!! BANANA REPUBLIC | Take 40% off your purchase, and each day one category is an extra 10% off. | Picks: Besides the cardigan featured in my outfit, I own and love the Pleated Tulle Midi Skirt (OOTD upcoming) and the very comfy Madison 12-Hour Pump (also in calf hair, on me here). And though it’s sadly excluded from the promo I recommend the Aire Turtleneck Sweater for its great neckline. More picks in this recent post. EXPRESS | It’s another 40% off everything weekend, and I can’t get enough of these!! | Picks: I have a few Express OOTDs coming up, featuring this flattering bateau sweater, this spectacularly fun party dress and this pair of two-toned jeans, which you can see on me in my Instagram stories or here. FREE PEOPLE | As we predicted, the Free People 4-Hour Black Friday promo is happening TONIGHT (11/16)!! This will get it’s own post around 1 PM, however, you can pre-shop with my picks in this post and this post. J. CREW | Take 35% off dressed-up styles and 25% off everything else. Use code READYTOPARTY. | Picks: If you need a party dress I recommend this one; if you need an everyday dress I recommend this one. The bags I linked in my outfit are both 25% off! MADEWELL | Are you an Insider? (If not, you should be, it’s their free loyalty program!) Icon level insiders get access to a special shopping promo this Saturday from 9-11 AM, in-store only. (Email me for details!) Insiders get 25% off Sunday morning from 9-11 AM. | Picks: I have an OOTD with this beautiful wrap top coming up soon; I’m so in love with this sweater and everyone I see it on; these jeans are the best ever. NORDSTROM | Take up to 40% off sale through November 18. You can see the newest women’s sale items here. | Picks: All this rain and snow calls for some Hunter boots, don’t you think? One of my favorite purses is 40% off (small size here) and this universally flattering dress is now 25% off, with select colors 40% off. Full post for this sale on Sunday. OLD NAVY | Take 40% off your purchase; cardholders get 50% off. | Picks: Thinking ahead to holiday festivities, I plan to wear these velvet jeans a lot. You might think I’m nuts but I really like this metallic puffer jacket! (It also comes in silver and non-metallic versions.) I’m also loving their Fair Isle sweaters. I realize I’m overdue for an Old Navy post so look for one with gift ideas soon! SUNDANCE CATALOG | Their Friends & Family event is happening now! Take 20% off your order by clicking this link through November 19 or with the code SMFBOA. Discount reflects in cart. | Picks: I can’t recommend the Pearl Melange Necklace ($228 before discount) enough. This may finally be the sale where I pick up this long-admired necklace and this one, which you can see working very well together many places on Sundance’s site including with the white colorway of this top. More Sundance Catalog picks in this post. What is the fee people sale? I didn’t get an email and it’s not showing up in the app. I’ve been waiting to buy a pair of boots and if today is the day I’m going for it!! How does one get the code? I have the app and an account and get tons of emails I just didn’t get this one. Sometimes for their sakes I tend to get notifications halfway through the day. It's 20% off purchases $250-$499 and 25% off purchases over $500. It's happening all-day in select stores and I believe from 6-10 PM your local time online (but don't quote on me the online timing, it may be 8 PM to midnight local time). There's no code — the discount automatically applies during checkout. Thank you! Is Black Friday the same sale? Nope, this promo tonight is IT. (Unless Free People changes up the way they've done things the last few years, which is always a possibility!) This promo only happens twice a year and the other time is in the Spring. On Black Friday we can expect an extra % off FP sale. This is the best FP sale – will put a cart together. Awesome! Very excited to discuss the sale further later today. oh man, I'll have to sit this one out. There's nothing I like at FP that much but I had my eye on a couple things. Maybe there will be new sale items next week??? Quite possibly evb! I think bigger sale will come early to mid-December but we shall see. I don't mind being wrong about that kind of stuff. Really love this outfit Roxy! You layer for Fall very well and have inspired me to pick up that cardigan! I'm feeling overwhelmed by all the promos right now but have a couple of items on my FP wishlist so I'll be shopping that sale. Looking forward to your post for it. Thank you Lindsey!! I am sure you'll love the cardigan. I ended up getting it and another cardigan at Banana Republic in multiple colors. I've been reading your blog for years and this might be my favorite outfit of yours ever. It's very stylish and I like every piece! I remember that J. Crew bag and how much hoopla there was to grab it during the JCA heydays. Your in-laws' house sounds very cute! Growing up my grandparents had a home in Bridgehampton but it's no longer in our family. This makes me want to go out there for a weekend. I'm not a huge Free People fan so I'll be sitting that sale out. I do love Sundance though so thank you for that code! What are you going to get in the Sundance promo? 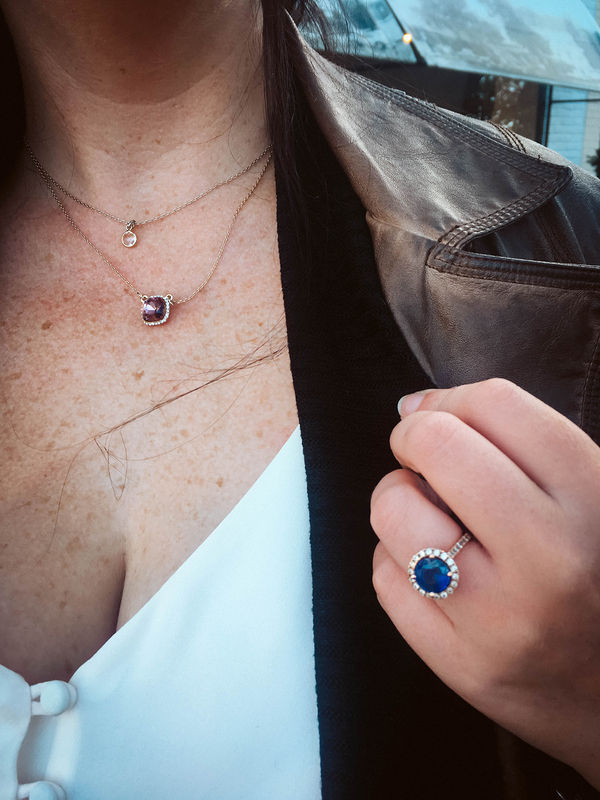 Is that sapphire ring your engagement ring? Gorgeous!!! Love your parents house – the ivy makes it so English looking. So excited for the FP sale. I'm only getting one thing, but I've been waiting patiently for months to have it. It *is* my engagement ring!! Didn't Alex do an amazing job? I feel the ring is so us, and very much my style. He choose a deep blue sapphire color because of his eye color and everything I look at it (which is still quite often, I won't lie) it feels like I'm looking into his eyes. Yes those Rockstars are awesome!! I don't know why but I always have to size way up in Rockstars. 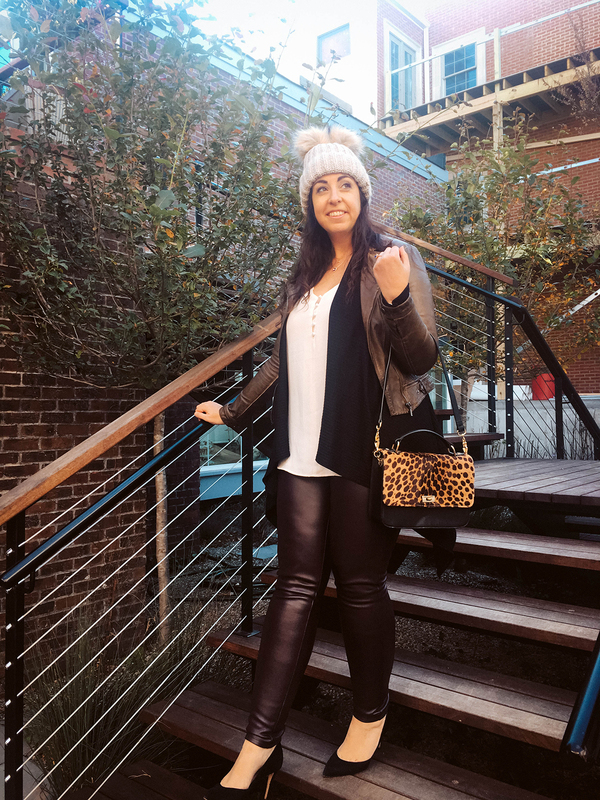 How love how you styled the leather leggings! It's cozy yet chic! And oh my didn't realize all this sale is happening. They're so good! Thank you Rach! And YES this Free People event is not to be missed! You look so happy! That alone makes this outfit really shine. Love that jacket (will have to put it on my Christmas list) and the necklace and OMG your ring!!! Gorgeous. Very excited for the Free People sale and your post! I'm also placing an order at American Eagle this weekend. They're having a stacked promo. Thank you Guest!! And ahhh right how could I forget AE? Will add them when I'm back in front of my laptop. What did you get there? I've loved all three ways you styled these leggings and I bought the black pair. I also convinced my sister to get the black pair in Plus, she's so happy they have her size. No FP sale for me tonight but I hope Anthropologie's Black Friday promo is just as good. Awesome Andrea! Yes it is nice to see LOFT and other stores carrying plus now, and not making a big deal about it. I too hope Anthropologie's Black Friday promo is really, really good!! Fantastic outfit Roxy! The leggings make your legs look 5 miles long. I also really like the white cami/black cardigan/brown leather jacket pairing. It's simple yet so chic. Such a cute fall look! Love the bag! Thanks Belle! I hadn't been using this bag much but this Fall I've rediscovered it and adore it. Love your outfit. It is layered perfectly. Thank you Melodie!! I can understand that, I do wish they didn't make a minimum amount for the discount. That outfit is so cute and you look stunning in it. I could totally see myself rocking those leggings. So sweet! Thank you very much Megan. Thank you Jess! I know, I'm so excited to play with layering too. Love this time of year for clothing!! So many deals, I'm definitely gonna check out Nordstrom! So cute Roxy! I like your outfit so much. The leggings are such a great color! I am shopping the Old Navy sale this weekend. Got myself a puffer coat, three sweaters and a pair of those velvet rockstars mentioned all for under $100. This Mom doesn't have a very big shopping budget so I'm delighted to get so much for my money! I also got my kids two new outfits each and cute PJs. Thank you Emma!! It sounds like you made some great pickups at Old Navy! I'm liking that shiny metallic puffer coat a lot. I may have to get it. I love me some leather leggings!! Yes! Especially these. They're such an easy way to dress up any outfit. I love this chic black outfit with the pop of leopard with your purse! 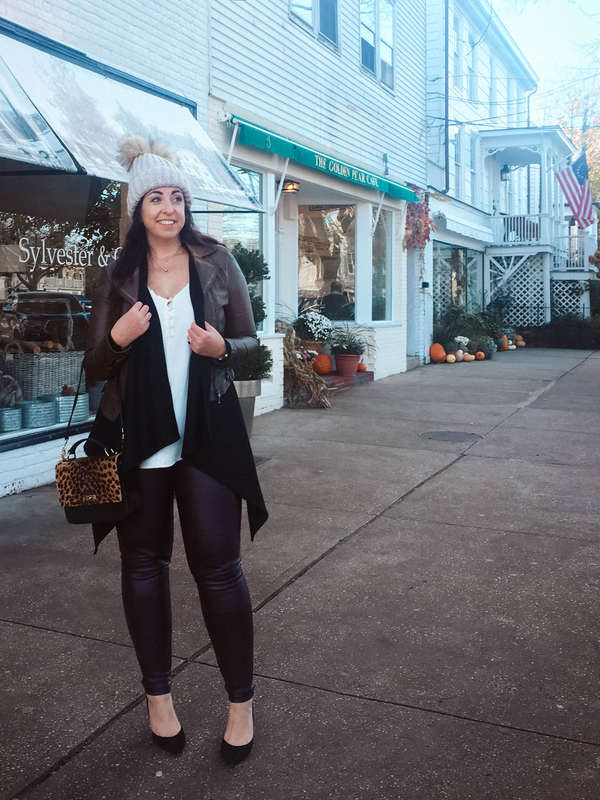 A pair of leather leggings are a must! Thank you Kim!! This bag is one of my favorites, I'd forgotten about wearing it but now with leopard everywhere again I'm reinvigorated and looking forward to using it often. Love this look! 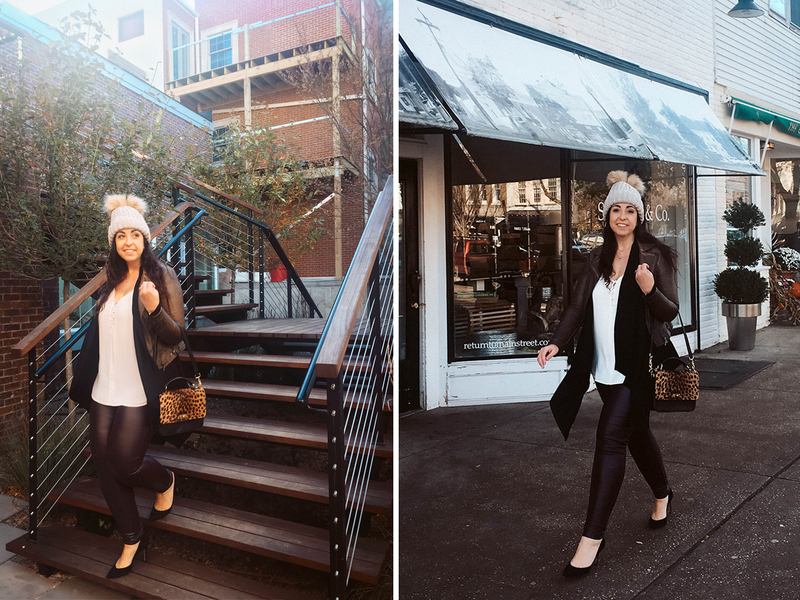 Your beanie and leggings make the perfect cozy & chic combo! So many great sales! I wish I would have seen this one Friday for the Free People sale! AHHH! Oh no Liz!! But I bet they do something good for Black Friday and maybe a lot of this stuff hits sale right after the holidays anyway. You just never know with FP! OT but anyone’s Friday FP orders ship yet? And anyone read that J Cew CEO resigned? What is going on with them??? Mine shipped, and I already received one package! I read multiple articles and they all basically said the same thing. I was in a store on Saturday and have to say it was a lot of the “ old” j crew feel with rich textures prints and fabrics. Not too sure about quality though. YAY! Hope you love what you got! The quality at J Crew is awful. And look at the reviews – yikes!! BUT – Quality is awful almost everywhere. I've been getting about 80% of my clothes second hand this year. I just can't lay down money for junk. I"m really fortunate to have many excellent consignment shops in my area. I only head to the mall these days when I'm looking for something really specific. Not sure why they don’t listen to customers. all everyone wants is quality fabrics, seams, linings, etc. I’ve seen it said over and over in multiple reviews. Yet they keep churning out the poly, crappy fabrics, unlined jackets, pilly sweaters… enough! People will pay more for things that last!! I agree Stefanie, I think J. Crew is moving in the right direction under Johanna Uurasjarvi's design leadership. Now they just need to improve the quality. In today's rollout they 90% just repeated silhouettes from the previous year. I find that troubling from a design standpoint. Maybe spring will show Ms. Uurasjarvi's input more. Thank you so much Jamaria! Yes agreed, lots of great sales going on right now!! I'm overwhelmed with these sales already. I liked it better when I knew there was going to be a Black Friday sale and that was it. Now there are different sales and types of sales every day and it's really confusing. Anyone else feel this way? Oh yes! It's too much and symptomatic of the current harsh retail climate. I'll have a post up later today that should help you sort through.